MATERIAL WANT (2016) is a continuation of the artistic practices of readymade and assemblage that appeared in the early 20th century with Marchel Duchamp, Dada and Surrealism. In today’s digital world objects can exist without any physicality, such as in the form of a 3D file: born from scanning or created, then copied exchanged or modified before eventually becoming a tangible material object. These are the found objects that Matthew Plummer-Fernandez and JODI have used as the raw matter for their sculptures. Collected by bots from the many internet sites publishing the 3D creations of millions of amateurs, they constitute a snapshot of this entropic popular production enabled by digital tools and networks, blending individual creativity with 3D scans, copies and variations of everyday items or icons of mass culture. Other bots will subsequently remix these found objects in a multitude of assemblages as uncanny and as beautiful as the chance meeting of a sewing-machine and an umbrella on the dissecting table (Lautréamont, Chants de Malrodor, 1869). At the end of this generative process the artists will carefully select some of these mashup objects and refine them to allow their passage from the virtual to the material world, thanks to 3D printing. The Material Want exhibition was produced by iMAL and its first show happened in Brussels, September 2016. More on the iMal website. Matthew Plummer-Fernandez (UK/CO) is a young artist/researcher out of the Royal College of Art, UK. 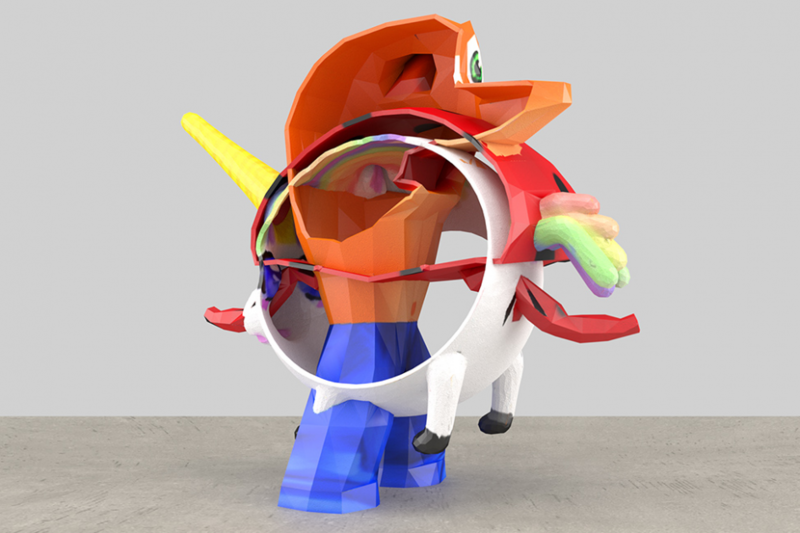 He uses computational processes and digital fabrication techniques to produce digital alienations of everyday objects (e.g. ‘Glitch Reality’). JODI (BE/NL) is an internationally recognised duo of net art pioneers. They create works in which they combine online and plastic interventions, using both internet vulnerabilities and the content of online social platforms.